Kh. Krista West has made a name for herself as a wonderful tailor of Orthodox church vestments. She does lovely work; I bought an exorason from her three years ago to replace the cheap, ill-fitting, mass-produced cassock that I originally got when I was tonsured as a reader, and it is high-quality. I have heard people gripe about her work being supposedly “the exact same thing you can get through one of the ecclesiastical suppliers, just for three times the cost”, but I know the difference, and that’s just not true. If one follows the principle that the most cost-effective way of doing anything is to do it right the first time, then Kh. Krista’s work is definitely worth it. Yes, I may pay four times for an exorason from her what I paid for one from one of the supply houses, but I expect one of her garments to last me a lifetime if I take care of it properly, as opposed to replacing it every few years. Kh. Krista has done a lot of work, through media efforts like The Opinionated Tailor, to try to inform laypeople about the importance of, not just vestments, but good vestments. She’s a practitioner of a liturgical craft who, to the best of her ability, tries to be as informed about her craft as she can be, and also an evangelist through that craft, and through education about that craft. This is something I truly respect. As somebody with similar objectives in the craft I work in, I find it intriguing, but also unfortunate, that the people who work seriously with the liturgical crafts of Orthodox Christianity are put in a position of having to be the best advocates for those crafts, rather than the leadership of the Church itself. Sometimes it can very much seem like lay and clerical leadership tries very hard to downplay advocacy for liturgical crafts, either out what is called “pastoral necessity” or a desire to “not reify worship” or simply from a lack of resources making it necessary to speak of them from a spiritual, rather than practical, standpoint. I’ve seen this with music, I’ve seen it with architecture, I’ve seen it with vestments. Orthodox Arts Journal I think is a good venue for discussion of a lot of these things, and I’d love to see Kh. Krista write a piece for them. Architect Andrew Gould also has pulled together his own workshop/cooperative for liturgical crafts, and vestments are among what his collaborators are producing. My hope here is that “more is more”, and that this points to more of quality being produced by all involved, in all disciplines. So, the most recent fruit of Kh. Krista’s efforts is a book — Garments of Salvation: Orthodox Christian Liturgical Vesture, published this year by St. Vladimir’s Seminary Press, and they were kind enough to send me a review copy. I’ll talk about the book in a moment. Before I do so, however, I need to talk about how I approach reviews for this blog. As a blogger, I really try to review things first and foremost from an inherently friendly, constructive, and appreciative perspective. This isn’t to say I try to make every review an exercise in sending everybody off with a head pat and a “Good try!” at the very least, but I also don’t want to be a nitpicky critic who tears things down because he enjoys tearing things down, because I don’t enjoy tearing things down. I should also say that this is different from my persona as a writer of academic book reviews for scholarly journals, where it is my job to be critical and merciless where it is necessary (and I have most certainly done that when I have had to). Bottom line, I don’t like to be jerk if I don’t have to be, and even when I have to be, I try to not be any bigger of one than is necessary. However, even within the rubric of “not being a bigger jerk than I have to be”, I still have to report fairly and honestly on things I review for this blog. If something has problems, I have to be up front about what those problems are — but I will endeavor to be as constructive in my discussion of those problems as I can manage. I don’t want to be in the business of hatchet jobs; I want to be helpful, not obnoxious. So, all of this is is a very long-winded prelude to saying that there are severe problems with Kh. Krista’s book that can’t be sugar-coated, and this is going to be a negative review (one that I really don’t want to write). My hope is that it can be a constructive review, however, because there is a lot here that deserves a hearing; there’s just a long way to go yet before it gets there. First off, this is a great topic. Vestments are, along with iconography and architecture, one of the most striking visual elements of an Orthodox service. Even if one is in a storefront church with two mounted print icons on easels at the front, there’s going to be a fully-vested priest (probably). The iconography of the priesthood that the vestments carry will at least go with with the person who himself stands as the icon of Christ at the altar, even if other iconography might be lacking. Kh. Krista seeks to cover a lot of ground with this topic, too, starting off with a Prologue that summarizes her own journey from recent convert to experienced vestment maker, with a discussion of Photios Kontoglou’s writings on Byzantine aesthetics as providing a basis for her understanding of the principles at work. The first chapter outlines the theological import of vestments in terms of incarnational theology, the sanctification of matter, and the heavenly beauty of the Church; the second chapter traces the historical development of garments from antiquity through late medieval Byzantium; the third chapter discusses in detail present-day use and practice; the fourth chapter looks at church furnishings or “paraments”; the fifth chapter is a discussion of the Byzantine perception of color and how that applies to the colors of vestments used throughout the liturgical year; the sixth chapter is about the history of textiles used for Orthodox liturgical vestments. There is then an Afterword that is something of a manifesto about how Orthodox Christians in this country need to approach the vestment tradition, and then appendices on the practical care of vestments, the prayers of vesting, and a glossary of terms. Secondly, this is a great topic being tackled by somebody who clearly has a lot to say about it and has gone to great lengths to understand it from the inside out. As the above outline hopefully makes clear, Kh. Krista speaks about vestments from a number of different vantage points; the history of their development, the materials they’re made from, how rubrics in the service books about color assume a different perspective on color than our modern view, how they work in conjunction with other liturgical furnishings, how the textiles are made, and so on. These are all worthy things for Orthodox Christians to think about, whether they might be wearing them, making them, or simply looking at them being worn. What do these colorful garments mean, where do they come from, and why do our clergy wear them? Unfortunately, this book is hampered by a lack of an obvious intended audience, which subsequently keeps the book from having sufficiently specific focus or a clear structure. It is further hampered — and this, I think, is the core problem — by an apparent lack of proofreading or outside readership at the pre-publication stage, which is made evident in some obvious factual errors and an approach to citations that is at once overdone to the point of being distracting, but also not as informative as one would want. To put it another way: this is a book that needs to decide whether it is primarily for clergy and interested laypeople, or if it is a more academically-shaded work (but perhaps still at the popular level). Right now it is trying to be both, but it manages to be neither. First of all, there’s the typo on Phrygia, but then there’s the reference to the Council being “at the end of the fourth century” with the years given as 342-380. 342-380 cannot be considered “the end of the fourth century”, but then Laodicea was actually in 363-64 to begin with, which also can’t be considered “the end of the fourth century”. And while she’s right that Canon 23 speaks of the orarion, to attribute Canon 23 of Laodicea to Chrysostom is a head-scratcher, since he wasn’t there and would have been all of 16 years old when it took place. To Kh. Krista’s credit, her footnotes help one track down the error — although, again, a typo hinders the effort somewhat; note that we go from citation xxii to citation xiii. Since the next citation is numbered as xxiv, I assume she means to give the notes in sequence, so looking at citation xxiii, she cites page 37 of Archimandrite Chrysostomos’ Orthodox Liturgical Dress, published by Holy Cross Orthodox Press in 1981. Page 37 of this book does indeed talk about the orarion and Chrysostom’s mention of it: “The first use of the sticharion as a purely liturgical garment is recorded in the writing of Saint John Chrysostom. Chrysostom describes a garment which in every respect is the sticharion, but he uses the word chitoniskos to identify it.” The author provides a footnote; it’s a Patrologia Graeca reference, and looking it up, it’s from chapter 6 of Chrysostom’s Homily on Matthew 26:26-28, not the acts of the Council of Laodicea. Finally, as a minor point, describing chitoniskos as “linguistically related” to chiton is too imprecise of a statement to be at all informative. “chitoniskos from chiton” would be sufficient here. Another factual problem is Figure 10 on page 66 (below). 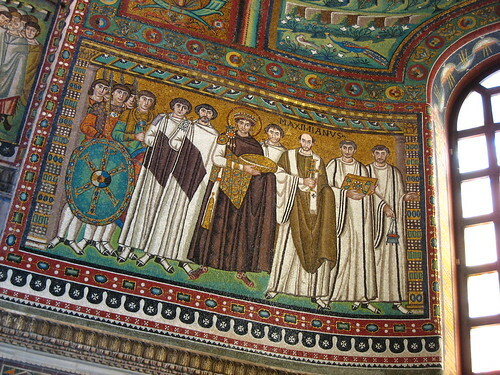 This is, in fact, Sant’Apollinare in Classe, but it’s not the same image as what she shows. I grant that they are similar enough in the broad strokes that it’s easy to see how the error might happen, but this is still a major misidentification. It’s particularly unfortunate because later in the book Kh. Krista mentions seeing San Vitale in person; it’s clear she knows the difference, but this mistake made it into the manuscript and through the editorial process regardless. The book’s citation system is helpful in cases like this, but it is also at once overdone and underdone. Kh. Krista, for some reason, uses both endnotes and footnotes, inserting numbered footnotes for additional commentary and Roman numeral endnotes for source citations. I’m not sure I understand what this accomplishes, and it’s certainly not a standard approach. Better to do all endnotes or footnotes, or, if one must separate source citations from comments, to use parenthetical citations. The problem isn’t just how she does it but also when, however; in the third chapter, she speaks extensively of practical matters concerning vestments — how they are made, what they look like, who wears them, and when — but cites almost nothing in terms of sources of this information, and this is particularly concerning when she asserts that this is the oldest tradition or that one is not in keeping with tradition. This is certainly descriptive of some customs regarding the cantor’s use of the exorason; however, something that needs to be addressed here is the instruction of the Ecumenical Patriarchate that the psaltis‘ cassock is to be indistinguishable from that of the priest, and not made distinct by collars or sleeve width, precisely because the cantor is part of the clerical order and not something separate. Kh. Krista also does not mention in her historical discussion the distinctive vestments worn by the psaltes and domestikoi previous to the fall of Constantinople (and colorfully recreated by the Romeiko Ensemble). There are three more problems I’ll mention briefly; there is a historiographical problem, in that her historical treatment (particularly of textiles in chapter 6) does not adequately acknowledge periodization. Does the rich textile industry she describe persist from late antiquity until the Latin Empire in 1204? 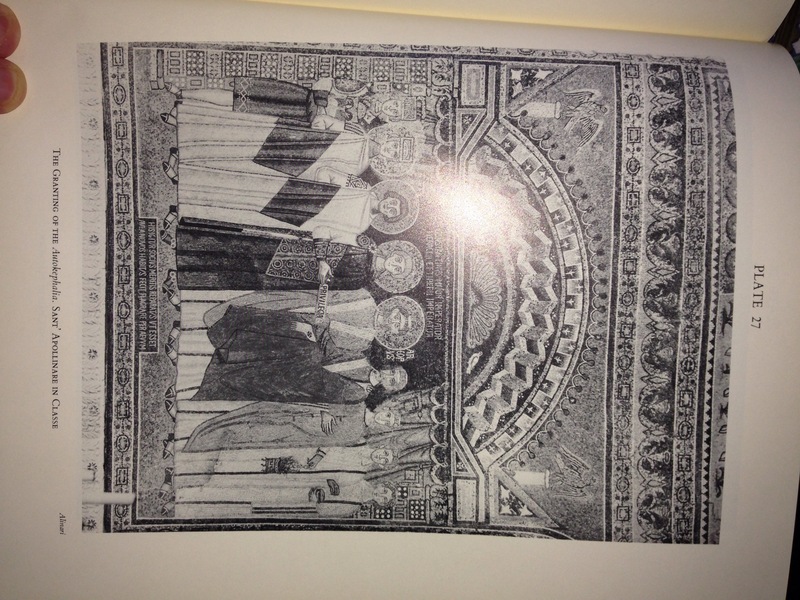 How, then, to make sense of Liutprand of Cremona, who writes during his visit to Constantinople in the middle of the 10th century that the robes are “old, foul smelling, and discolored by age”? Periodization is always arbitrary, to be sure, but it will be helpful here to keep from misleading. There is also a bibliographic problem, in that even in English language literature, there is much missing from her citations that would help her discussion. One of the most interesting chapters in the book is about how the Byzantine conception of color is very different from the modern understanding of the spectrum, and the work of Liz James here would be incredibly useful — notably, Light and Colour in Byzantine Art (Clarendon Press, 1996), as well as her more recent article “Colour and Meaning in Byzantium” (Journal of Early Christian Studies 11.2, Summer 2003, pp223-33). Mark Bradley’s Colour and Meaning in Ancient Rome (Cambridge University Press, 2011) would also probably be a worthwhile reference. Finally, there’s a theoretical problem, and it’s one that troubles everybody who would be a practitioner of traditional Orthodox liturgical crafts in this country; p.79-80 avers that “[t]he study of vestment construction… must be based upon the traditional apprentice and master model in which one desiring to learn the craft of vestments must study with a master tailor for a period of several years.” And yet, what Kh. Krista tells the reader of her own journey to being a master tailor she tells in largely the language of an autodidact. How do we reconcile this? I don’t know. It is certainly the reality of being an Orthodox Christian in this country that easy access to the sources for this kind of knowledge is not readily available — as I’ve recounted here before, the closest Byzantine chant teacher to where I live is five hours away, and I ultimately found it more practical to go to Greece for a summer and find somebody there. All of this said — and I need to stress this, since I’ve spent around 2000 words talking about the problems — there is a lot here that’s good, it’s just a question of getting clear on the audience and reworking it accordingly. The good parts here are disjunct; her foregrounding of Photios Kontoglou’s aesthetic writings is really nice, for example, but it’s not threaded through the entire book sufficiently to feel like a framework. Besides that, it feels like there are pieces of at least three books here; a historical treatment, a description of present day practice, and a call-to-arms about what Orthodox Tradition means in the United States. These parts can be synthesized into an organic whole, but it’s not there yet. Right now, the problem with citations aside, the chapter where she talks about present-day practice is her surest footing, and is what I would look to as the centerpiece of any revision. Perhaps the book is really for an audience that doesn’t need citations, just a list of books at the end titled “Additional Reading”, in which case the history chapter really could get away with being a summarized version of its present form that’s a few pages long. Or, maybe it really is a more scholarly treatment, in which case the third chapter is still a great anchor, it just needs to be clearer where she’s getting her information. In either case, once the focus is figured out, then the long block quotes from secondary literature need to be summarized rather than quoted, the citation system needs to be straightened out, the errors need to be fixed, and I would also make a strong plea for at least some color plates. I’d like to close this review by saying that I think Kh. Krista has probably made about as honest of an effort as somebody in her position could possibly make on the first draft of a project like this. Errors happen, focus gets lost, chapters get away from people — even for the most celebrated of scholars! Unfortunately, much of the apparatus that used to be standard for publishers in terms of getting books to the next level after the first draft — outside readers, copy editing, fact checking, etc. — is, so people at my own lowly level are told when we attend publishing workshops, cost-prohibitive for all but the most financially secure of presses. It is unlikely that even a seasoned academic will be able to successfully edit and evaluate their own book without mistakes creeping through, so as far as I’m concerned, none of this really reflects badly on Kh. Krista, the “just a tailor” who is clearly more than “just a tailor”. My sincere hope, however, is that this feedback will help spur discussion between the author and the publisher on how to make the second edition the excellent book that it I have no doubt that it can be.